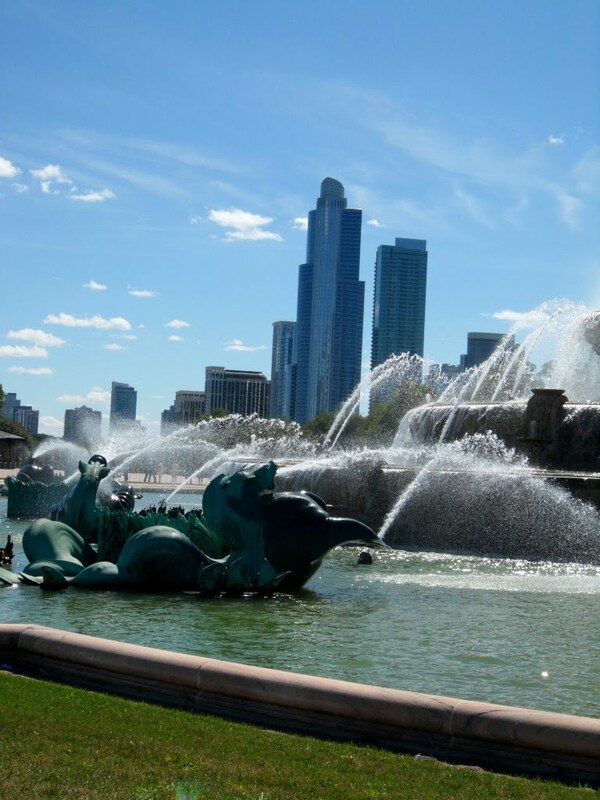 Are you humming that song in your head (Chicago, Chicago, that wonderful town...)? I am, ever since last weekend when I fell in love with that city all over again. It had been quite a few years since my last trip there and I'm happy to say it has not changed all that much (which is a good thing). 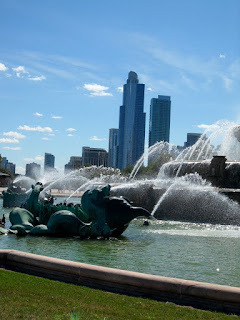 I had read somewhere that Chicago was one of the most popular cities for Labor Day travel and trust me, it was packed. But that didn't deter me from doing a fair bit of sightseeing and, more importantly, eating well. Dinner the first night was at The Publican, a really cool restaurant in the Fulton Market area. They seat you at long, communal tables unless you specify a private booth. The menu isn't huge but I liked the fact that you could order small (tapas-like) plates or the traditional appetizer, entree, etc. We opted for the small plates so we could try a variety of dishes. To start us off, we ordered the tasting of aged hams (I never pass up aged hams): Serrano from Spain, Country Ham from Benton, Tennessee, and LaQuercia Rossa from Iowa. I had heard for years about the incredible quality of hams from LaQuercia and was thrilled to be able to try it. The trio was served with hearty, house made bread served with an incredibly delicate goat butter sprinkled with sea salt. Each ham was unique and delicious. For our next course, we ordered Yellowtail Crudo served with Trinidad Peppers, Pistachios, and Cilantro - the Yellowtail melted in your mouth. At the time, they offered Fried Clams from Maine served with spicy tartar sauce and oh-so tender eggplant. The clams were fat, sweet, and juicy - as good as I've had at some of my favorite roadside stands in coastal Maine. Seeing as how we should probably have some vegetables, we ordered the Green Beans sauteed with Chile Flakes and Crispy Shallots - fabulous! Dessert (pictured above) was delicious Pecan Cake served with Sauteed Apples and Pecan Ice Cream, alongside French press coffee. Everything about dinner at The Publican was top-notch. If you are in Chicago, don't miss it! My next foodie stop was at Xoco, the Rick Bayless Mexican street food spot. Since this was a last-minute trip, I could not get reservations at Frontera Grill or Topolobampo but I was determined to eat at one of his restaurants (Xoco does not take reservations). They open at 7am for breakfast and lunch starts at 11am. We arrived about 12:30pm and found a 45 minute wait (I happily got in line). It is kind of a strange system, though. You place your order at the head of the line, but the hostess doesn't let you order until she knows there is a table available. There is quite a large menu, ranging from delicious guacamole and "just made" chips to wood-burning tortas or tortas from the griddle to salads and side dishes. After much deliberation (and plenty of time to review the menu), we decided on the Milanesa: Crispy Gunthorp chicken, black beans, artisan Jack cheese, pickled jalapenos, tomatillo-avocado salsa, and the Ahogada: Golden pork carnitas, black beans, tomato broth, spicy arbol chile sauce, pickled onions. They offer beer and wine by the glass, in addition to freshly made ice tea and lemonades. Our two lunch dishes were wonderful - the chicken in the Milanesa was tender, moist, and crisp with just the right amount of pickled jalapenos and salsa. The pork dish was in a fabulous, spicy chile sauce that if left to sit for a few minutes soaked the bread perfectly. So even though we ordered way too much food and were pretty stuffed, of course, I could not pass up dessert. Especially when it was house-made Mexican vanilla soft serve ice cream! If there were soft-serve ice cream like this at my local Carvel, I'd be there every day! Rich, creamy, with flecks of vanilla pods - it was heavenly. You can order the ice cream with crumbled bits of Mexican chocolate or bacon streusel. I was dying to try the bacon streusel but I was already OTL (over the limit) with food consumption and there were still many meals to come. I did not leave, however, without purchasing two Pecan Shortbread cookies (more to come on that later). Below is a photo of the Ahogado Torta. Although we were staying at a lovely boutique hotel (The Talbott, about a block off Michigan Avenue), that offered breakfast, we wanted to try some of the local breakfast restaurants. One morning, we hopped the train to the Belmont area and had a delicious breakfast at Ann Sather's, a Chicago institution. Started in the early 50s as the Chicago version of a diner, Ann Sather's offers the Swedish take on breakfast: Swedish pancakes with Lingonberries (where else can you get lingonberries besides Ikea? ), Salmon Omelette with Fresh Dill, etc. Along with every egg order, you get two sides (they are hearty eaters in Chicago!). We couldn't pass up the world-famous warm cinnamon rolls, which really were delectable. Another morning, we had a great breakfast at Yolk, a hip diner with three locations. Only open for breakfast and lunch, they offer many variations on eggs, a multitude of pancakes and French toast, fresh-squeezed juices, and great coffee. My personal favorite was the creamy oatmeal with plump golden raisins, sliced bananas, and brown sugar. One evening we had a light dinner at Cafe Spiaggia, with a view high over Michigan Avenue. I enjoyed a terrific Pomegranate Kettle One Citrus Martini served alongside crisp Parmesan Flatbreads. Dinner was a delicious, tender Veal Rib served with creamy lentils and zucchini. Cafe Spiaggia is the slightly casual off-shoot of Spiaggia (right next door), which is more formal (and an Obama favorite). And what visit to Chicago would be complete without pizza?! On our last night, kind of tired from three whirlwind days of sightseeing and eating, we didn't feel like getting dressed up or venturing too far from the hotel. The hotel concierge, Gene, recommended Pizano's, right around the corner. Now, I've sampled Chicago deep dish pan pizza on previous trips to the Second City and was not all that thrilled, so I was less than anxious to spend my last opportunity for Chicago eats at a pizza parlor. But it was close by so we figured "why not?" I'm here to tell you that I am now a convert to Chicago pizza - but thin crust Chicago pizza (who knew there was such a thing?). First off, I must tell you that I loved the atmosphere at Pizano's. This is a working class, small bar/restaurant on State Street that has been there for years. Populated with families, couples, groups, we were greeted with a 30-45 minute wait. But here is another Chicago restaurant with a strange ordering system. They encourage you to "pre-order" your pizza. We couldn't quite grasp this idea, but went along with it and ordered "Pat's Brickhouse Special," thin-crust sausage and mushroom. They write your order on a tiny slip of paper and stick it in the reservation book. We were sure we'd never get our pizza! Thirty minutes later, they called our name, showed us to a table, and a very friendly waitress came over fully knowledgeable about our order. Another 15-20 minutes went by and out came a fabulous pizza! The waitress told us that when you pre-order the pie, they half-bake it, and when you sit down, they finish it off. Not the most conventional system, but it seems to work. I loved this pie! The crust was buttery, the sausage and mushrooms were flavorful, and the whole pie was perfectly crispy (see photo below). Pizano's is a must for Chicago thin-crust pizza. After scarfing down almost the entire pie, dessert was not an option. But that's only because I knew waiting back at the hotel was the Pecan Shortbread cookie from Xoco. A quick detour to the Starbucks on the corner before heading back, for a Vanilla Latte to accompany my cookie, and I was in dessert heaven. This cookie was moist, rich, buttery, packed with ground pecans, and a sprinkling of sugar on top. This might just be the perfect cookie... I wish that I had bought more to bring home with me. Hmmm, sounds like a good excuse for another trip to Chicago.